You can renew eligibility for new loans and grants and eliminate the loan default by “rehabilitating” a defaulted loan. To qualify for FFEL or Direct Loan rehabilitation, you have to make 9 monthly payments within 20 days of the due date during a period of 10 consecutive months. The 9 out of 10 rule basically allows you to miss your payment one month, but still be eligible to rehabilitate. An interruption in this consecutive period is allowed for qualifying military service members or affected civilians. These borrowers may resume their rehabilitation payments after their service is completed. See the special programs for military section of this site for information about other options for military service members and certain civilians affected by war or national emergencies. If you are rehabilitating a FFEL loan, the guarantor must attempt to find a lender to purchase the loan after you have made the required payments or if no seller can be found, assign the loan to the government. There is no resale requirement for Direct Loans. Once rehabilitation is complete, the loan is removed from default status and you are eligible for new loans and grants. The default notation should be removed from your credit record. In most cases, however, the other negative history will remain until it gets too old to report. You can regain eligibility for federal assistance before you complete the rehabilitation as long as you make six monthly reasonable and affordable payments. However, you will need to complete the rehabilitation to get out of default. Loan holders may add collection costs to the new loan balance, but this should be no more than 16% of the unpaid principal and accrued interest at the time of the sale of the loan. The Department of Education says that it does not charge these fees to borrowers rehabilitating Direct Loans, but the they will charge fees against each of the nine qualifying payments. Once full eligibility for rehabilitation has been achieved, only the principal and interest balance of the loan is transferred to a non-default servicer. From that point forward, no further collection fees are charged unless/until the borrower re-defaults on the loan. This policy could change, so it is a good idea to ask about whether the government is going to add collection fees to your balance after rehabilitation. You are entitled to get out of default through rehabilitation only once per loan. If you rehabilitated before August 14, 2008 and go back into default on that loan, you can still rehabilitate again. However, this new rehabilitation will be subject to the one-time limit. You will need to request rehabilitation from your loan holder. You will most likely be dealing with a collection agency. In the past, it was very common for collectors to tell you that you had to pay an unaffordable amount. This was wrong then and is still wrong. The law says that you only have to pay what is reasonable and affordable. There is no minimum amount that the loan holder must charge. The current rules should work much better for borrowers. Do you have a complaint about a collection agency? Here is how the system works under current law: The loan holder should discuss your options, including the pros and cons of loan rehabilitation and loan consolidation. If you decide on rehabilitation, the loan holder should start out with the amount you would pay under the IBR formula. This is the IBR formula for older loans, based on the borrower making student loan payments of 15% of disposable income. This does not mean that you are eligible for IBR while you are still in default. Instead, the loan holder will use the 15% IBR formula to determine a reasonable and affordable payment amount. If you successfully rehabilitate a Direct loan, you can then request one of the other income-driven repayment plans. The loan holder will ask for your adjusted gross income (AGI) to figure out your 15% IBR payment. The loan holder will make an initial estimate of your reasonable and affordable payment based on the information you give them about your income. You will likely have to follow up and provide documentation of your income in order to get the rehabilitation started. If you do not file taxes or if your most recent tax return is no longer accurate, you will need to submit alternative documentation of income. There is a minimum $5 payment. The loan holder may tell you that you have to make a “good faith” payment while they are waiting for you to submit documentation of your income. This is your choice. You do not have to make this payment. However, you may want to do this so that you can get started with the nine month rehabilitation period. Be advised that these payments will count toward the nine months only as long as the final rehabilitation payment amount is not higher than the amount you are paying as a “good faith” payment. If you object to the 15% IBR amount, you can negotiate a different payment, but you must use a standard form to provide additional income and expense information. The loan holder can ask you to provide documentation of income and expenses. If you make this choice, be advised that your payment will likely increase after the rehabilitation period. At that point, you can request deferment if you qualify or forbearance if you cannot afford the post-rehabilitation payments, but these are time limited options. You should think carefully about whether it is a good time to rehabilitate if you don’t think you will be able to afford the post-rehabilitation payments. If you are having your wages garnished, you have a one time right to have the garnishment suspended if you make five required rehabilitation payments. The rehabilitation payments are in addition to the amounts being garnished. You should list the garnishment amount if you are using the financial disclosure form (see above) to determine the “reasonable and affordable” rehabilitation payment. Clearly the money garnished from your pay has a big impact on your budget! You may successfully make it through the rehabilitation process only to find that the loan holder has put you in a standard repayment plan with payments that you cannot afford. You should carefully track when the rehabilitation period is over. Once you have rehabilitated, your loan is out of default and you are eligible for any of the pre-default flexible repayment plans. Particularly if you applied for an income-driven repayment plan, the servicer may also place you temporarily in an alternative repayment plan. The Department says that your payments for 90 days after rehabilitation will be the same as the payments you were making before the rehabilitation ended. You can apply for a new payment plan during this period, including income-driven repayment. There will usually be a new servicer after your rehabilitated loan is sold or transferred. It is a good idea to ask your current loan holder to give you the name of the new servicer as soon as possible so that you can arrange for an affordable payment plan. Your FFEL lender may be unable to sell the loan after rehabilitation. Under current policy, you are required to keep making payments until a buyer is found, but this should not be a long period. If the lender cannot find a buyer, it is supposed to assign the rehabilitated loan to the Department. You might also want to consider consolidating into Direct Loans after a successful rehabilitation. Q: Can my loan holder continue to contact me even after I have signed a rehabilitation agreement? A: Yes, but only very limited contacts. Collection during the rehabilitation period is limited to collection activities that are required by law and to any communications that support the rehabilitation (for example, monthly statements with the amount your rehabilitation payment listed). Q: What if my lender won’t agree to a rehabilitation payment amount that I find reasonable and affordable? A: The best way to deal with a collector insisting that you pay a higher amount or that you have to make a down payment is to tell the collector that you are aware of your right to a reasonable and affordable payment plan and to keep pushing until they give it to you. If you still don’t get anywhere, you should try contacting the Department of Education ombudsman office or one of the guaranty agency ombudsman offices. You should also consider filing a complaint. If you still can’t get anywhere, you might consider contacting a lawyer. Q: What standard does the Department use to evaluate my expenses if I use the income and expense form instead of the 15% formula? A: The Department uses the Internal Revenue Service (IRS) expense standards as guidelines for acceptable expenses. For expenses that are not limited in the IRS standards, such as medical costs, the Department also does not set limits. Q: How is the payment set if I use the income and expense form? A: The Department initially set the payment at 100% of the difference between household income and expenses. The Department says it has changed this policy so that the payment should be set at 15% of discretionary income,” defined as the difference between the borrower’s household income and household expenses (after some reported expenses are subjected to reasonability limits). Should I consolidate or rehabilitate my student loan? PDF, 131 KB. 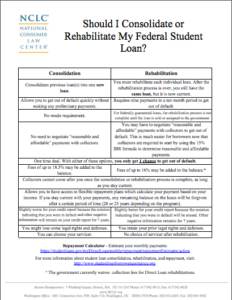 Download and print out this worksheet to help you review your options and determine whether consolidation or rehabilitation is right for you.